Since 1987, People in Transition (Alliston) Inc., “My Sister’s Place” has been providing support to women and their children in south Simcoe County. They provide emergency shelter, crisis counselling, outreach and legal advocacy, as well as transitional housing support services. Through accessing these services, women and their children begin their journey towards a life free of violence. Our guild has been proud to participate in a community project with My Sister’s Place over the last few years. 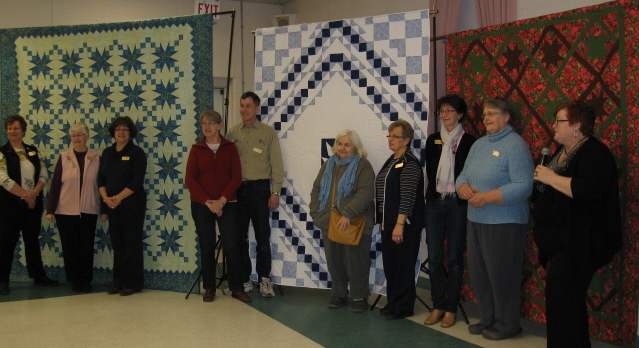 Members have created approximately 160 quilts for women and children who have need of their services. Members have generously given of their time and materials to provide comfort to those in need. As a community resource, Matthews House Hospice provides a special place for people in need. It is their goal to offer compassionate physical, emotional and social support to people living with life threatening illness, their families and caregivers as well as the bereaved. Matthews House provides many day programs such as yoga, playing with colours, men’s group and circle support groups. Matthews House is a safe place to relax, to learn, to help let go of worries and get energy for the journey ahead. Recently, Matthews House Hospice has lost a large amount of their funding. In order to assist in fund raising, the Quilting Corners Guild has provided a number of quilts to be used in raffles by Matthews House. 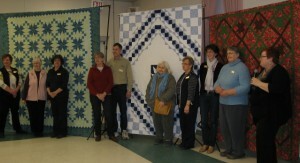 Members of the guild provided materials and time to create these lovely quilts.